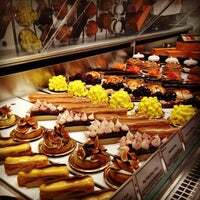 Dominique was my pastry chef for 7 years before opening his own bakery. I love to pop in for some flaky DKA, or a special seasonal treat for my wife. If I’m lucky he sometimes sends me a cronut! Perfect little egg sandwich & fresh Madeleines were delectable. Family waited on Cronut line and said it was worth it. One flavor only per month so check ahead if you have picky eaters with you. O cronut e o croissant de presunto e queijo são maravilhosos! 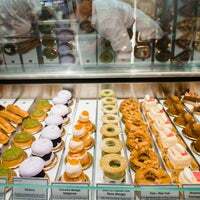 Ao invés de ficar na fila kilométrica para comprar o cronut, vale a pena comprar antecipado no site deles e ir retirar! 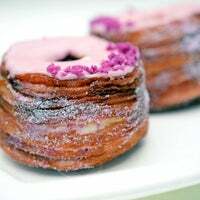 Ohhh the Cronut – this trendy hybrid attracts a line at 7am before opening but is well worth the early wake up and wait. Enjoy this innovation or any other famed treat in the lovely outside seating. 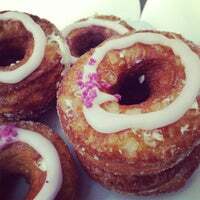 the cronut is absolutely worth trying, even though it may not be for everyone. (also try the DKA!) if you place a large order in advance you won't have to wait in line! 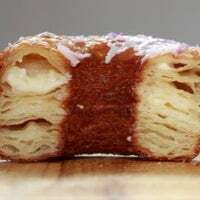 I know everyone talks about the cronut, but the real star here is the kouign amann aka "DKA!" And don't forget the butterscotch eclair. Best bakery in NYC, hands down! U have to be there when they open early in the morning so u can get everything u want 💔 everything was sold out except for the frozen s'mores and they were heartbreakingly good. If you're in the market for a Cronut, skip the line with a little advanced planning. Reserve up to 6 Cronuts for pickup 2 weeks out on Mondays at 11am. Reservations go quickly, so no dilly-dallying. Fantastic place. Queue up for the Cronut. It is a hundred percent worth it. The Madeleines are made fresh as you order them, and the croissants are probably better than some you'd get in Paris. Ice cream marshmallow, pear cream cake and cherry black forest cake. 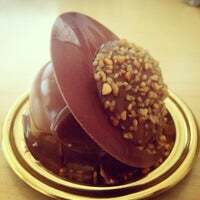 Sweetness, appearance and taste of desserts - make you speechless. Be sure you go there before 8 am to have special croissants..
Come approximately an hour before the bakery opens to guarantee yourself a Cronut. Come at around 2 PM for a cookie shot. The Frozen S'mores and DKA are good too. Penguin marshmallow doesn't float. Everything this bakery produces basically is crispy/crusty shell on the outside and soft/chewy in the inside.From the torched frozen smores to the DKA.Don't miss the flourless chocolate pecan cookie. 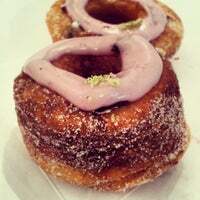 The Cronut™ is the creation by Chef Dominique Ansel that many have described to be a croissant-doughnut hybrid. It is trademarked product only available here. Beware of imitations. the frozen s'mores are really cool! it's marshmallow (toasted when you order it) around a layer of crunchy chocolate with vanilla ice cream in the center. a bit pricey, but worth trying at least. Magical combination of croissant and doughnut: cronut ❤️ Make sure you check this place out every month for different flavors! The cronuts live up to the hype. Wasn't sure about the Caribbean Rum Raisin (Nov '14), but they are simply amazing. DKA (Kouign Amann) IS a close second. The coffee is great, too. 1. Be prepared to queue for cronuts (5.5$) 1-1.5h even on weekdays! 2. There is a possibility to pre-order on the web-site. 3. Crispy outside, great filling, smooth texture. 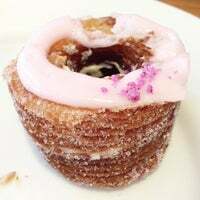 So I didn't get to try a cronut (this time) but I was able to try many of the other AMAZING items on their menu, and I was not disappointed. Anything you order will satisfy. Dominique Ansel was there! Don't want to wait in line? Order cronuts in advance! You can either roll the dice by calling the bakery at 11am for 2 weeks in advance, or order in bulk (minimum of 50) a month in advance! My first visit was to pick up a Cronut, but it's since become my go-to quick breakfast spot when I'm in the area. The croissants are flaky and delicious. The staff is welcoming and knowledgeable. 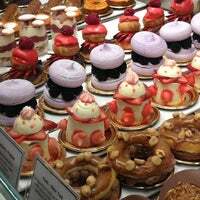 While everyone knows this as the Cronut Bakery, You can't go wrong eating anything here. I highly recommend the DKA, the Madelines, the Frozen s'more on a hot day, or any of their seasonal treats! The cronut was amazing! Also the DKA is a must try! I wasn't expecting it to be as good as it was. Definitely one of the best bakeries I've been to! 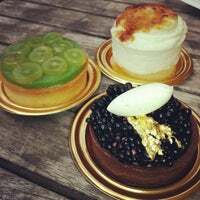 their cronuts are definitely worth it and there are always new flavors each month. the grapefruit panna cotta is refreshing and light. and cookie shots are a perfect after work/school/anything treat. The cookie shot and DKA are both amazing. I didn't get to try a Cronut but I hear the DKA is just as good, and they're available all day - no waiting in line. "good at pretty much everything–that includes sorbets, which are dense and creamy and come in flavors like green apple and raspberry. Our tip? Top your scoop with baby meringues for a dollar extra." Awesome awesome place! 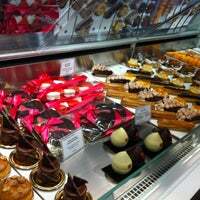 Super creative pastries that are decently priced. If you can, get a cookie shot! I highly recommend the frozen smores too! Saw the frozen smore (ice cream inside chocolate inside a marshmallow) on facebook and had to go check it out! $7 and perfect for your sweet tooth. 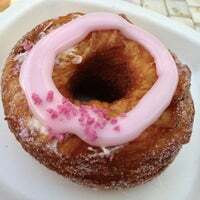 By far, the DKA is better than the Cronut! It's actually the best DKA I've ever eaten in the US! Skip the Cronut line, by getting a Cronut Pass, or coming here outside of work days. Tried all the fun desserts (cookie shot, frozen s'mores, blossoming hot choc, cookies) and while they look extremely appealing, they lack in tastiness. Great concepts but flavor doesn't meet the hype. 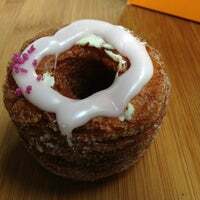 On vient ici d'abord pour le Cronut, il se vend désormais sous la forme aromatisé avec un saveur unique et différente pendant un mois. Essayez aussi les madeleines ainsi qu'un bon chocolat chaud. 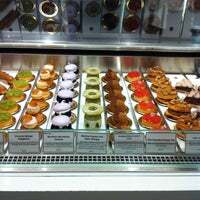 Dominique Ansel Bakery was awarded Time Out New York’s “Best Bakery of 2012” and Metromix’s “Best Bakery of 2012”. 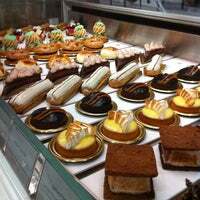 Today, it is also Zagat 2013’s highest ranked bakery with 27 points awarded for food. In 2013, he was nominated as a James Beard Award semifinalist for Outstanding Pastry Chef. "A great spot for breakfast on the weekdays or a place to rest mid-day from errands in the area. Can't go wrong with avocado toast (with eggs in the am or crab in the pm)." "The mushroom quiche (pictured) is very good. But the chocolate chip cookie is to die for. Seriously heavenly." "Salmon was fantastic and dessert (chocolate vanilla pastry) was really really good too. 10/10 for service also"
"The incredible muffins here are from Blue Sky Bakery in Park Slope, slight sugar coating with fruit filled centres, best I've had. Pair well with the cold brew."